Personally, I blame my fascination with all thing Russian on growing up in Alaska and reading The Hunt for Red October at far to young of an age. I hope you all will interperate today’s paper doll outfit as an expression of love for the art of Ivan Yakovlevich Bilibin and not a statement on current events in the United States. I’ve loved Russian fairytales for most of my life. Well, I love all fairy tales, but the Russian ones I think resonated with me more than a lot of the others. Perhaps it was growing up in Alaska where there was a lot of Russian culture still or perhaps I saw in Ivan Biliban‘s illustrations a landscape I recognized- over grown forests and snow. In fact, I sometimes think my fondness for flat color and heavy line is in part because of the exposure to those illustrations. At the time, those things were a limitation of the printing medium, but Biliban took advantage of them to make incredible works of art. It really was the golden age of children’t book illustration. 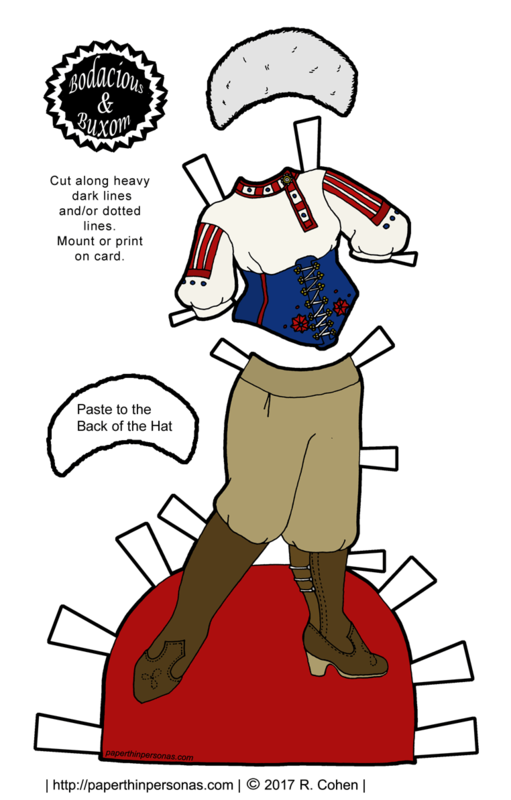 Anyway, today’s set of printable paper doll clothing consists of a traditional Russian style blouse, a corset, trousers tucked into books and a big fur hat. Everything is better with a big fur hat. The blouse is based on a kosovorotka which is a side fastening men’s shirt. See? I did some research. Questions about today’s paper doll outfit? Thoughts on other wonderful classic children’s book illustrators? Let me know in a comment! And consider following the facebook page, if you want to show the blog some love and support.